As legend had it, the archaeologists wrote, Abel Beth Maacah was a fortified crossroads connecting the kingdoms of Israel, Damascus and Tyre, and "perhaps the seat of a local oracle." The archaeologists plan to return to the site later this month and keep digging. Buried under a pair of hills at Israel's northern border, at the nexus of three ancient kingdoms, is one of the last large biblical sites yet to be uncovered. So said an international team of archaeologists after they started to dig up the ruins of Abel Beth Maacah five years ago. The lost town is also one of the more enigmatic places mentioned in the Old Testament. As legend had it, the archaeologists wrote, Abel Beth Maacah was a fortified crossroads connecting the kingdoms of Israel, Damascus and Tyre, and "perhaps the seat of a local oracle." It's unclear to which king the town was loyal, they wrote - or whether it belonged to a possibly mythical fourth kingdom called Maacah. Only a few stories about the town are told in the Bible, and all of them are more tantalizing than illuminating for scientists who want to know what Abel Beth Maacah actually was. "Why do you want to swallow up the Lord's inheritance?" she asked. The soldiers said they just wanted the traitor. So the wise woman had her people cut off his head and toss it over the wall, and King David left Abel Beth Maacah alone. The Israeli and American-led team of archaeologists were about five years into their excavations last summer, "digging through the floor of a massive Iron Age structure" when they found the head beneath the top of the site, the Associated Press wrote. The exquisitely-carved head was about two inches around, encased in a clump of dirt that dated to between 900 and 800 B.C. - a period when King David's Israel had splintered into two kingdoms, and Abel would have been in the middle of a complicated geopolitical power struggle between its many neighbors. Which raises the question: Who was the man whose likeness is captured in the figurine, and what did he mean to the people of Abel? "We're guessing probably a king, but we have no way of proving that," Robert Mullins of Azusa Pacific University, who is co-directing the American side of the excavation, told LiveScience. That the man was important is obvious. Even aside from his crown, regal beard and elegant hair, the AP wrote, he was crafted with artistic precision almost unheard of for that time and region. "His almond-shaped eyes and pupils are lined in black and the pursed lips give him a look that is part pensive, part stern," the university wrote in a news release. He is made of a glasslike material more commonly seen in Iron Age jewelry. 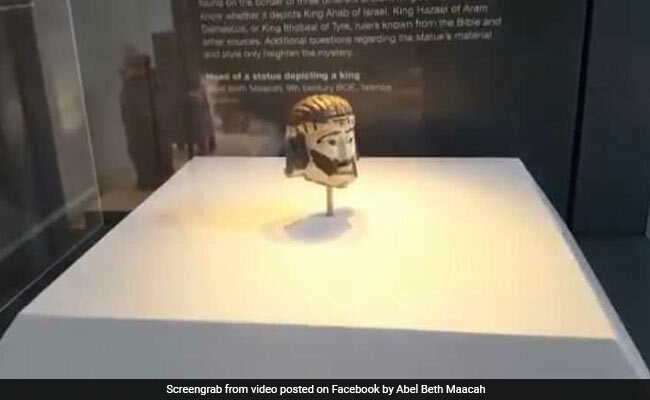 The archaeologists rushed to put him on display at Israel Museum, where he is simply labeled as "head of a statue depicting a king." Which king is now the central question, and the answer could shed more light on the encompassing mystery of Abel Beth Maacah. "Virtually no extra-biblical sources exist to clarify this matter," the archaeologists wrote in their history of the town. And the Bible's references to Abel are invariably brief and vague. But what scientists do know suggests that Abel likely switched kings and loyalties fluidly throughout the 9th century B.C. - meaning that the sculpted head could belong to one of several feuding monarchs. Interestingly, two of the most likely possibilities would intimately connect the head to one of the Bible's most notorious characters: Queen Jezebel of Israel. In the Bible, Jezebel is usually depicted as a blasphemous traitor to her kingdom, who was eventually thrown out a window, trampled by horses and eaten by dogs. For centuries afterward, she became synonymous with immorality, and is now the namesake of a Gawker spinoff. But historically, Jezebel may have been unfairly vilified, as one author has argued. In any event, she was a powerful queen who united the families of two neighboring kingdoms: the daughter of King Ethbaal of Tyre, and wife to King Ahab of Israel. And both of those men happened to rule around the time the head was carved. "Given that the head was found in a city that sat on the border of three different ancient kingdoms, we do not know whether it depicts the likes of King Ahab of Israel, King Hazael of Aram-Damascus, or King Ethbaal of Tyre, rulers known from the Bible and other sources," Azusa Pacific University wrote. "The head represents a royal enigma." Whether the ruins of Abel Beth Maacah held the likeness of Jezebel's husband, her father or some other king, the archaeologists plan to return to the site later this month and keep digging. Perhaps then they'll find the figurine's body then - and another piece of a nearly 3,000 year old puzzle. In The #MeToo Era, Feminist Theologians Publish "Women's Bible"